The cancer industry consists of corporations, organizations, and agencies that diminish or mask the extent of the cancer problem, fail to protect our health, or divert attention away from the importance of finding and working to prevent the disease. BCAction speaks freely and truthfully about the politics of breast cancer and the cancer industry as a whole, because we adhere to a strict corporate contributions policy that prohibits us from taking funds from any organization that profits from or contributes to cancer. What is the cancer industry? What is National Breast Cancer Industry Month? Why doesn’t BCAction take money from corporations that profit from breast cancer? Where did the pink ribbon come from? Should I buy this? Where does the money raised by pink ribbon products go? Do those “click for a mammogram” websites really work? The cancer industry consists of corporations, organizations, and agencies that diminish or mask the extent of the cancer problem, fail to protect our health, or divert attention away from the importance of finding the causes of breast cancer and working to prevent the disease. This includes drug companies that, in addition to profiting from cancer treatment drugs, sometimes produce toxic chemicals that may be contributing to the high rates of cancer in this country and increasing rates throughout the world. It also includes the polluting industries that continue to release substances are known or suspected to be dangerous to our health, and the public relations firms and public agencies that protect these polluters. 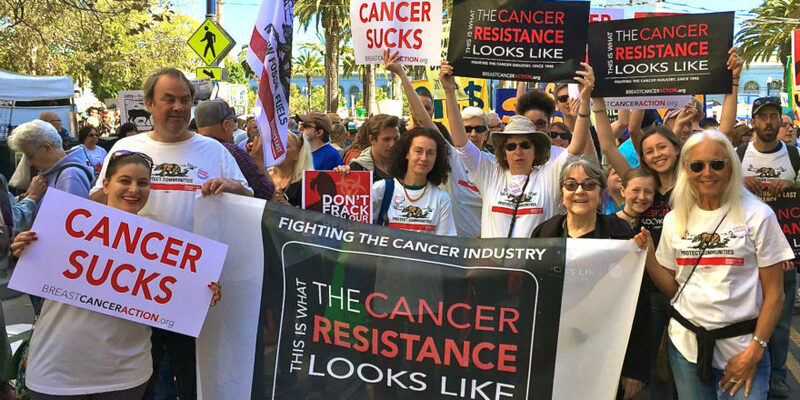 The cancer industry includes organizations like the American Cancer Society that downplay the risk of cancer from pesticides and other environmental factors, and that historically have refused to take a stand on environmental regulation. What is the National Breast Cancer Industry Month? Every October begins the media blitz known as National Breast Cancer Awareness Month (NBCAM). Pink ribbons abound, and the message you keep hearing is, “Get Your Mammogram!” No mention is ever made in the official NBCAM materials of the need to find the causes of cancer so that we can prevent it. Not surprisingly, NBCAM was originally created by a drug company — now called AstraZeneca — that, in addition to producing breast cancer treatment drugs, profited from the sale of an herbicide known to cause cancer. To bring attention to this history and the need to find true cancer prevention, activists reclaimed October and renamed it National Breast Cancer Industry Month. Throughout the month, various campaigns are held to educate the public about the corporate connections to cancer and the need to refocus attention on what needs to be done to stop cancer before it starts. BCAction wants people who receive our information to be secure in the knowledge that what we say is in no way influenced by who gives us money. In August of 1998, BCAction became the first national breast cancer organization to adopt a corporate contributions policy that bans the organization from knowingly accepting funds from corporations that may create a real or apparent conflict of interest for BCAction, or whose practices endanger public health or may contribute to cancer incidence. Corporations covered by this policy include, but are not limited to pharmaceutical companies, chemical manufacturers, oil companies, tobacco companies, health insurance organizations, and cancer treatment facilities. This policy is intended to ensure that BCAction remains independent from outside influences in the pursuit of its mission and to avoid potential or perceived conflicts of interest. During the month of October, pink ribbons everywhere remind us to race, drive, cook, and shop for the cure. But where did the pink ribbon come from? As the word spread, executives from Estée Lauder and Self magazine asked Haley for permission to use her ribbon. Haley refused, and Self magazine was startled by Haley’s answer. “She wanted nothing to do with us. Said we were too commercial.” But Self really wanted to have her ribbon. The magazine consulted its lawyers and was advised to come up with another color. It chose pink, a color that focus groups say is “soothing, comforting, and healing” — everything breast cancer is not. Soon Charlotte Haley’s grassroots peach ribbon was history, and the pink ribbon became the worldwide symbol for breast cancer. Breast cancer has become the darling of corporate America. Companies use the pink ribbon to sell their products and boost their image with consumers as they boost their bottom line. Meanwhile, breast cancer rates continue to rise every year. Ending the breast cancer epidemic will take more than just pink ribbons and awareness. Learn more about pink ribbon marketing and what you can do to help create real change to end the breast cancer epidemic. How much money goes towards breast cancer programs and services? For example, Yoplait donates 10 cents for every pink yogurt lid mailed back, meaning you’d have to eat three yogurts a day during the entire four-month campaign in order to raise $36 for the cause. If a company is not giving as much as you think it should, consider giving directly to an organization or charity that you think is doing good work. How are the funds being raised? Is it through the sale of cosmetics that contain chemicals suspected to cause cancer? Is it through a tournament on a golf course sprayed with pesticides? Is $1 being given each mile you test-drive a polluting car? Don’t let “pinkwashing” corporations exploit your good intentions by positioning themselves as leaders in the struggle against breast cancer while engaging in practices that may be contributing to rising rates of the disease. What types of programs are being supported? If research, what kind? Is it research at major institutions that already get enormous financial support, or is it innovative research into the causes of breast cancer that is currently underfunded? If services, is it reaching the people who need it most? Campaigns that are less locally focused may siphon funds away from the community and give them to larger programs and foundations that are already well funded. Do the programs being funded make steps towards ending the epidemic? Programs supporting “breast health awareness” will not bring us any closer to stemming the rising rates of the disease. The breast cancer movement is about more than just mammograms and finding a cure. It’s also about true prevention and guaranteed quality treatment for all people with breast cancer. It is education about the realities of breast cancer and action to create real change, and we don’t mean the kind you carry in your pocket. Do those ‘click for a mammogram’ websites really work? You may have gotten an e-mail asking you to visit www.thebreastcancersite.com and click a button to “fund free mammograms.” It sounds like a caring thing to do — it’s quick and easy, and it helps low-income women get screened for breast cancer. But is this what women living with and at risk for breast cancer really need? Get the full story before you click. Breast cancer research is a multibillion-dollar industry. In just one year of funding — 2007 — the National Cancer Institute (NCI) spent $572.4 million on breast cancer research. That same year, the National Institutes of Health (NIH) spent an additional $705 million. The Susan G. Komen for the Cure Foundation had total revenues that year of nearly $162 million. The Komen organization also claimed in 2007 that it had invested nearly $1 billion in breast cancer since its founding in 1980. This is only the tip of the breast cancer research funding iceberg. You’ve heard of the Komen Foundation and the NCI, but very few people know about the hundreds of organizations that raise funds in the name of breast cancer research, or the private companies that invest in and pursue new drugs and devices for use in diagnosis and treatment. A Google search for “breast cancer research funding organizations” turns up hundreds of results. At the federal government level alone, over 30 federal agencies are funding or conducting breast cancer research. So, not only is a great deal of money being spent on breast cancer research, but hundreds of agencies are spending it. Unfortunately, the work of these organizations is not coordinated. There is no way to tell whether the work being done by one research entity has already been done by another, or whether one set of researchers is in touch with others who might help advance its ideas. And very few research organizations are transparent about what they are researching or what the outcomes of that research might be, particularly when the results are negative. Given the enormous cost of cancer research (researchers seek grants in the hundreds of thousands of dollars), the stunning amount of money devoted to it, and the lack of coordination among the researcher groups, it’s impossible to know whether an individual’s gift will be well spent — or make any difference at all. Pushing the researchers to find both less toxic treatments and true preventive measures. Advocating for research that doesn’t simply focus on genes and biology but also includes social, racial, and economic injustices as root causes of breast cancer. We report to our supporters on what is happening in research. and how they can make a difference in moving research in the best direction so that affected communities are represented and protected. BCAction is the leader in transparency and accountability in the breast cancer world. When you make a gift to Breast Cancer Action, you’ll know exactly where your money is going and what it’s accomplishing. As the only national breast cancer organization that refuses to accept funding from companies profiting from or contributing to cancer, Breast Cancer Action is able to be very clear about what is — and isn’t — happening in breast cancer research. And, because we’re effective activists, we know how to make happen what needs to happen to save lives. So, the next time you write a check to advance breast cancer research, consider writing it to Breast Cancer Action.